After the beginning of 2016, I’ve made a personal resolution to get a home sold which has been on the market far too long and likely for reasons which could easily be resolved. 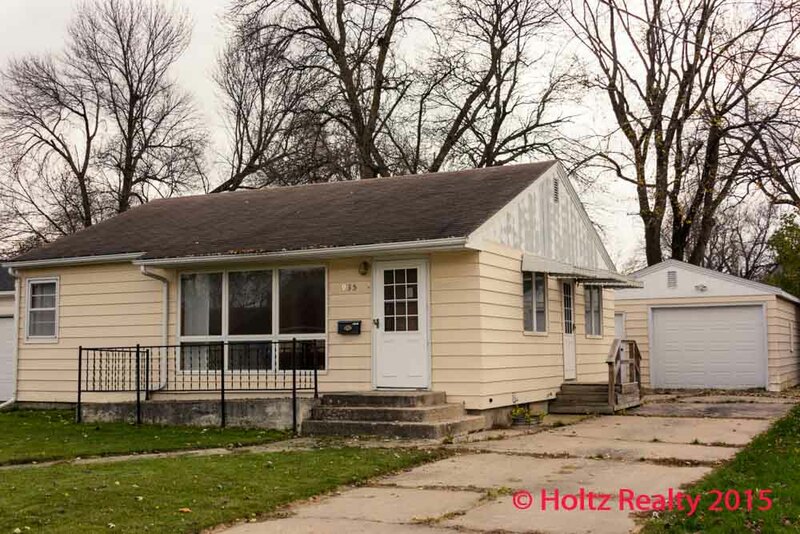 The above photo is of a 3 bedroom ranch home I have listed which is located at 935 – 8th St. SE here in Mason City. Many people believe the cracks in several of the basement walls will need radical measures to correct, but some months ago I had someone who was a client of mine a number of years ago look at the situation and he said, “These walls are not that bad. That’s all I would recommend is to jack hammer the big piece of concrete away from the front window and remove the small sections of concrete that are up against the exterior of the foundation, do some tuck-pointing of the interior cracks, paint the walls, and it’ll be good to go.” Having viewed in my years of likely hundreds of basements, I’d already suspected the problem wasn’t as bad as many had considered. Sometimes looking at a problem causes us to go to the extreme dark side rather than looking for more equitable solutions. I do hope a buyer with vision arrives soon and gets this solid home purchased before it becomes just another piece of inventory under the ownership of one of our City’s investors. There’s no question in my mind there’s some really fast equity to be built in this home which is waiting for someone with vision to unlock it. Click on the link below to view the particulars of this listing. By the way, I have a bit of a bone to pick with the world of technology. More and more these past months I’ve been finding buyers, sellers, and especially other Realtors texting me instead of making simple phone calls. Some of the language I find in those texts have been borderline rude as well as dis-respectful. I get messages asking me questions, I answer, and then nothing. Not even a TY. The isolationism along with all the sub-group-ism of society is all the more creating a breaking away of long-standing social standards. I was speaking to a young gentleman today about how many of the great sociologists are closely watching the “look at me” generation which is alive and well. According to their studies, there’s never been a generation of this kind in the past many hundreds of years past. It’ll be interesting to read of their findings. One of the comments made by him today was somewhat enlightening as well as disturbing. He said, “I believe the reason there are so many suicides with our young is that much in the social media postings show people having great fun with friends or family during vacations and special occasions, but they don’t show posts of themselves in their daily humdrum lives like most others are living.” That statement could possibly be one of the missing pieces to those puzzling deaths. I do believe he’s on to something. Many times most un-solvable problems have the answers right under our noses. I happened to hear of something today which caused me to become internally angry all over again. There’s a very dis-functional family whom I’ve known for more years than I’d ever wanted to be familiar with who’ve done many wrongs to society under the banner of whatever they do for the good of their “blood” family is OK no matter what they’ve done to others all due to their primitive hive mentality. After settling myself down, I started sending the real truth out into the Universe to where there’ll be created a “Divine Justice” of sorts and left it go at that. Because of all the generational wrongs they’ve created, there’ll soon come to their day of reckoning with those still living. When it happens, that’s all I’ll say is, “You and your people have done it to yourselves.” As far as I’m concerned, years of mental abuse is far worse than sporadic days of the physical. The pains of mental abuse usually last lifetimes and that’s what’s for me to be the most unforgivable.